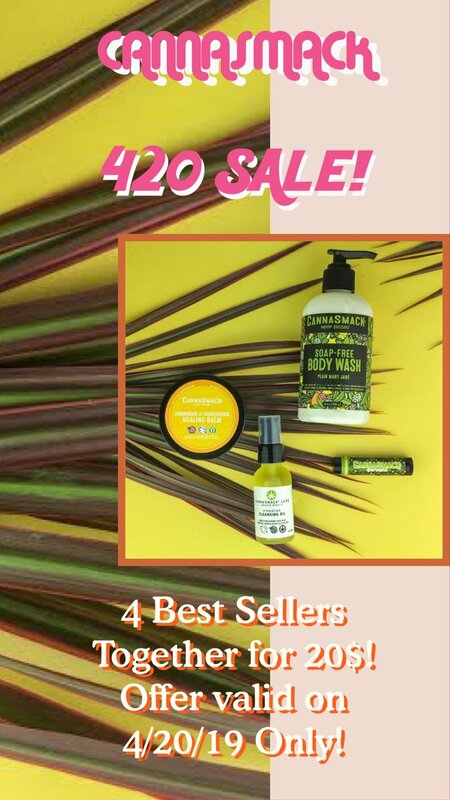 Apr 13 The Hemp Oil Cleanser I Swear By + 4/20 Beauty SALE! 420 is coming and my friends at Cannasmack have an amazing deal for the occasion! They are bundling four of their best sellers for 20$ This is a 4 for 20$ deal that is too good to be true! I know a lot of you have been curious about Cannasmack so this is a great deal to take advantage of and get familiar with the Cannasmack brand. Here is a little more about each item. The Hydrating Hemp Cleansing Oil from their Luxe Skincare line is BAE! I swear by this cleanser and use it every day. The (all natural) scent takes you to nirvana as the oil gentle lifts out impurities, leaving your skin clear and plump. The only item I have not tried is this Lemongrass and Frankincense Healing Balm. Made for extra deep hydration for rough and extra dry skin! The Hemp Lip Balms were the first product that got me hooked to Cannasmack. In various flavors, SPF and colored tints, these lip balms keep your pout perfectly moisturized. I was tired of my lips becoming addicted to the chapsticks I was using and drying out no matter how many layers or times I applies through the day. Not to mention, who knows what you are ingesting from certain brands lip products! Cannasmack all natural vegan lip balms are an upgrade! Follow @cannasmack and get ready for next weekends celebrations! Keep your eye on my insta @vikmargarita for reminders for this sale + more!